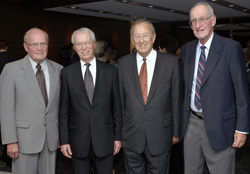 On June 12, 2008, Torys welcomed more than 200 alumni and current lawyers at a reception at the firm's Toronto office. The event was held in Torys' newly renovated client meeting spaces, which were created by Kuwabara Payne McKenna Blumberg Architects. Referencing the modernity of the Mies van der Rohe office complex, Torys' redesigned 33rd floor integrates technology and functionality, while showcasing the firm's contemporary Canadian art collection. Managing partner Les Viner welcomed the attendees, including Torys' founding partners.